Season two of The A-Team aired in 1983-84 and it’s pretty much the formula as before. And this is a very formulaic series. That should be a problem but it isn’t really - if you have enough energy and style you don’t need to worry too much about being dazzlingly original. In fact the familiarity of the formulaic elements becomes an asset - they’re things you look forward to seeing in every episode. I don’t think anybody ever watched this series for the tight plotting. The plots, such as they are, are an excuse for lots of cartoonish action, lots of gags and and for the actors to have some fun playing the outrageous larger-than-life characters who comprise the A-Team. It was all about fun. If you expect more from television than fun then The A-Team is not for you. But if you’re satisfied with fun then this series provides it in copious quantities. And for a series that seems on the surface to be unbelievably violent it’s actually good clean fun suitable for all the family. Despite the expenditure of thousands of rounds of ammunition every episode no-one actually gets hurt and you know that nobody is going to get hurt. There’s also (compared to contemporary television) a refreshing lack of moral ambiguity. There are bad guys and they get what’s coming to them, and there are good guys and you know they’ll come out of it OK. Moral ambiguity is all very well but it’s something you can get very tired of. You can also get very tired of television shows that are dark and edgy. The A-Team is not the least bit dark and edgy. Of course technically the A-Team are criminals, but they’re criminals in the way that Zorro or the Green Hornet or the Saint are criminals. We know they aren’t criminals at all. It’s also nice not to have to worry too much about plausibility. The A-Team doesn’t worry about plausibility one little bit. Amy Allen (Melinda Culea) quietly disappears from the show’s lineup during this season. Whether a female team member was really necessary is perhaps debatable but she was likeable enough. Obviously the producers did think a female regular cast member was necessary as Tawnia Baker (Maria Heasley) is later introduced a a kind of replacement for Amy. The Military Police, in the person of the indefatigable Colonel Decker (Lance LeGault), continue to grimly pursue the A-Team without any notable success. While he’s a humourless martinet he’s not really a villain. He is just doing his job, even if if he’s doing it with excessive zeal. And Lance LeGault was always a superb heavy. OK, maybe Dwight Schultz goes a little too far over the top at times as Howling Mad Murdock but this is after all a series that is aimed to a large extent at kids and if you’re twelve years old then he’s hysterically funny. And if you’ve totally lost touch with your twelve-year-old self then you're probably not going to enjoy The A-Team anyway. Diamonds 'n Dust opens the season in fine style. A pretty blonde Australian girl needs help to get her African diamond mine running in the face of opposition by a very crooked operator. Naturally there’s lots of mayhem including one of the improvised weapon systems that are always a fun feature of this series. One thing I liked about this episode is that the A Team is definitely doing this job for the money. Sure they like the idea of helping out a pretty girl but they also like the idea of the very big pay cheque involved. Recipe for Heavy Bread has the A-Team helping out an old army buddy from their Vietnam days. 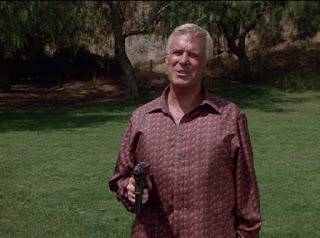 Except that Lin Duk Coo was actually A North Vietnamese guard at a POW camp in which the A-Team guys spent some time. But Lin was a real nice guy and they really liked him and if he’s in trouble they’re going to help him. Lin is not the only Vietnam War connection in this episode. There’s also a North Vietnamese general and he wasn’t a nice guy and now he’s mixed up in something pretty sinister. A good episode. In The Only Church in Town Face wants to help out an old friend but finds he’ll have to hire the A-Team himself if he wants the other guys to help him. The old friend is the only woman he’s ever loved but she dumped him fifteen years ago and he hasn’t seen her since. The A-Team is off to Ecuador and they’re going to be mixed up with nuns, orphans and bandits. Another good episode. Bad Time on the Border has the A-Team battling a gang that is smuggling Mexicans across the border, into virtual slavery. There’s nothing startlingly original here but it has all the classic A-Team ingredients (including an improvised armoured vehicle and hubcap bombs) and they’re all combined perfectly and it all works. And it has lots of nice little one-liners. When You Comin' Back, Range Rider? is a wonderful western romp with the A-Team going after rustlers. Not cattle rustlers, but horse rustlers. The bad guy is an evil cattle rancher. It has all the classic western ingredients with particular highlights being the train holdups (there’s even a vintage steam locomotive to pull the train). And then there’s B.A.’s improvised armoured train. Murdock convinces himself he’s the TV western hero the Range Rider. It’s a two-part episode and it also introduces a new would-be nemesis for the A-Team - Colonel Decker is a hard-nosed gung ho military police officer and he intends to succeed where Colonel Lynch failed and bring the A-Team to justice. The Taxicab Wars is one of the best season two episodes. It’s a nice idea. There’s a bit of a war going on between two rival taxicab companies. Things are getting a bit nasty, with cabs being sabotaged and drivers being beaten up. Finally, facing financial ruin, the Lone Star Taxi Company calls in the A-Team. 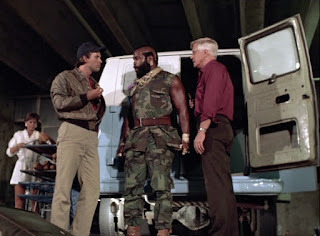 And the A-Team turns a commercial rivalry into full-scale urban warfare. Hannibal Smith and his pals don’t believe in half measures. If you’re going to get rough, go the whole hog, with massive destruction. It’s an outrageous over-reaction but it’s a lot of fun - everyone at some point in his life has wanted to respond to injustice with massive deadly force and this episode lets you live out those fantasies. Plus it’s fun seeing the horrified reactions of passengers to the mayhem and craziness unleashed by the A-Team. Labor Pains is like The A-Team meets Norma Rae. In this story they help oppressed farm workers set up a union. This is a lesser episode, not so much because it’s so overtly political but mostly because it just doesn’t have the necessary imaginative action sequences. It’s all a bit too routine although the van through the 55 m.p.h. sign sequence is fun. There's Always a Catch takes the A-Team to the seaside, to the cut-throat world of lobster fishing. There’s an evil mobster guy terrorising the decent fisher folk. The problem for the A-Team is that Colonel Decker is hot on their trail and the sensible thing would be for them to get out of town as fast as they can. But there’s no way they’re going to do that when there are people they’ve promised to help. This time Decker really thinks he’s going to nail the A-Team. It’s the usual mix of action and fun and it’s thoroughly enjoyable. Water, Water Everywhere has a basic plot that has been used countless times. Big rancher Frank Gaines is trying to squeeze out three disabled Vietnam vets in a dispute over water rights. It’s the little guy getting shafted and the A-Team don’t like seeing that happen to the little guy. There’s the usual action and there’s the usual improvised weaponry cooked up by B.A. and it’s all very much according to the A-Team formula and it works. And who doesn’t like to see the little guy come out on top? Steel is all about demolishing buildings, and about a company that discovers that some very powerful very nasty people are determined to stop them from going about their lawful business of tearing down buildings. The A-Team seems to be their only hope but even Hannibal Smith is worried when he realises the people he’s up against this time. Typical A-Team stuff and lots of fun. The White Ballot deals with a subject that American television never ever tires of, the corrupt small town sheriff. The hackneyed subject matter doesn’t matter since The A-Team is a style over substance affair and this episode has the essential A-Team style in spades. The Maltese Cow is a very strong episode. The A-Team goes up against a Tong that is trying to force their old buddy Sam Yeng to pay protection money. Taking on a Tong is like trying to fight a small army but the A-Team are not daunted. Chinatown is a fine setting for an A-team adventure. There are some witty fight sequences and there’s some lovely hardboiled dialogue. Murdock is in fine form, channeling Humphrey Bogart except that he thinks he’s on the trail of the Maltese Cow. Cult movie fans will be pleased to see veteran actor Keye Luke (number one son in the early Charlie Chan movies and later a regular on Kung Fu) playing Sam Yeng. 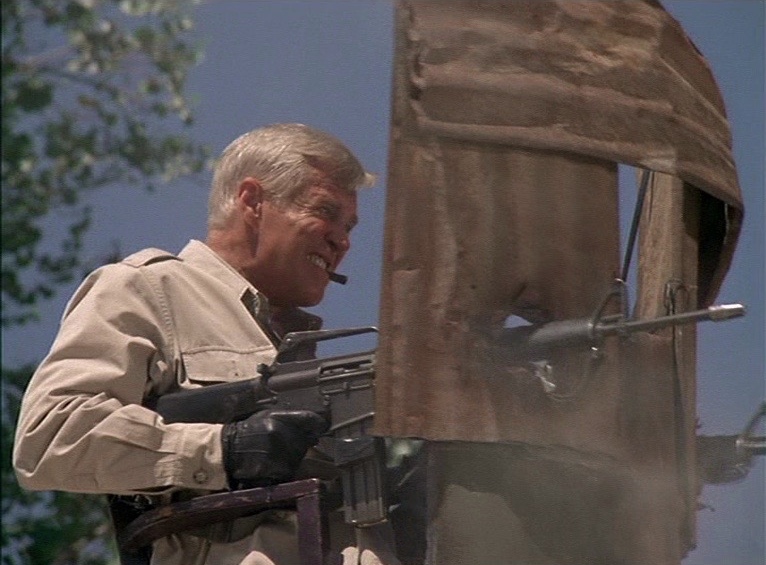 In Plane Sight takes the A-Team to Venezuela where they have to clear an American pilot of drug-smuggling charges. It’s a three-cornered contest with the A-Team, the drug smugglers and the Venezuelan Federales all hunting each other through the jungle. Murdock is being particularly disturbing in this story. He’s not doing anything crazy. That’s what’s disturbing. The team finds a new way to persuade B.A. to submit to flying. And there’s a plane chase through the jungle with the plane never leaving the ground. It’s mostly the familiar and very successful A-Team formula but with a few little twists and it’s a lot of fun. The Battle of Bel Air introduces Tawnia Baker. She’s a reporter and she’s been working undercover at a very high-end security firm and she’s discovered some disturbing facts about the company. She’s also discovered some facts about the A-Team, facts which interest her a great deal. She doesn’t just want to hire the A-Team. She wants to join them. She wants to take Amy’s place. 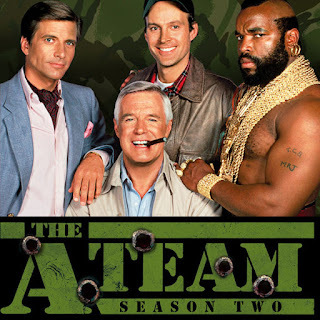 The A-Team do not want another member and they’re not sure they trust her at all but she’s landed herself in great danger and they pretty much have to help her out. They also have to foil a sinister assassination plot. Improvised armoured vehicles are a fairly standard feature of A-Team episodes but this time around they improvise a helicopter gunship which leads to a rather cool aerial battle. It’s another episode that more or less follows the standard formula for the series but with enough variations to make it very entertaining. Someone within the U.S.Army is selling Army weapons on the black market, someone else has discovered what is going on and that second someone has been murdered. 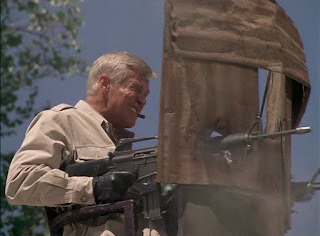 It’s a case for the A-Team and Say It with Bullets is obviously likely to provide plenty of trademark A-Team mayhem. Pure-Dee Poison pits the A-Team against moonshiners. Only these aren’t romantic rebel moonshiners, they’re selling stuff that is basically poison and quite a few people have already died as a result. A clergyman who’s an ex-paratrooper asks the A-Team for help. Tawnia plays a reasonably active rôle in this tale. There’s some classic A-Team mayhem. It’s good fun. It's a Desert Out There pits the A-Team against the Scorpions, a gang that robs tourists who’ve won big at a local gambling joint. The Scorpions seem to be planning some other kind of operation, something big. They ride around in armoured dune buggies. There’s plenty of action as usual, with the A-Team in an armoured bus battling the Scorpions in their armed dune buggies which gives the episode an interesting slight post-apocalyptic Mad Max 2 kind of feel. A good episode. Chopping Spree is a fun story about car thieves. Harder Than It Looks is a slight departure from the usual formula - B.A. doesn’t get to construct any improvised armoured cars or similar gadgets. There are some nice twists though, and plenty of action. And B.A. encounters a guy who is almost as tough as he is. And he keeps on encountering him. It becomes the episode’s running gag. Lots of fun in this outing. Deadly Maneuvers is another departure from the standard formula. This time instead of helping other people in trouble it’s the A-Team that needs help. A criminal syndicate that has suffered at their hands has employed a crack squad of four very mean mercenaries to exterminate Hannibal Smith and his men. But the A-Team isn’t that easy to exterminate. A very good episode with plenty of action. In Semi-Friendly Persuasion a Christian sect that is being driven out of a town asks the A-Team for help. The only problem is that the help has to be non-violent and the A-Team is not exactly famous for its non-violent methods. How long are non-violent methods going to work against very violent people, and how long will the A-Team persevere with such methods? An interesting story about very uncompromising people. Curtain Call is a bit of a filler episode, being padded out with flashbacks to earlier episodes. Murdock is badly hurt and everyone thinks he’s going to die so they’re remembering all his madcap adventures. Meanwhile Colonel Decker is closing on on them. A bit of a disappointing end to the season but the escape sequence is clever. There are a few attempts in the latter part of season two to vary the formula just a little, and they manage to work without departing from the show’s essential spirit. If you liked the first season you’ll like this one. Highly recommended.